Tomato rice is a delicious South Indian variety of rice. It is well loved by rice eaters. 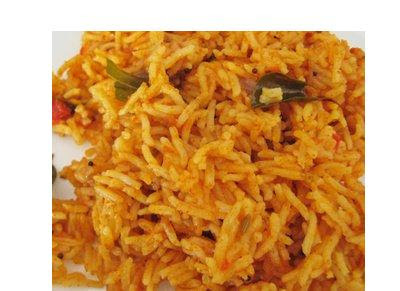 Tomato rice is a quick meal which comes as a saviour when you are short of time. Enjoy it with raita and papads. 1. Wash and soak rice for 20 minutes. Drain. Place rice in a pressure cooker with 2 cups of water and cook to 1 whistle. Let the rice cool down by spreading it in a big plate or tray. 2. Heat ghee in a kadhai/ wok. Add mustard seeds and when they pop, add chana dal. Cook on a low heat till dal turns light brown. 3. Add onion and curry leaves. Sauté till onion becomes light brown. Take care not to burn the dal. 4. Add tomato puree. Add salt, turmeric and red chilli powders. 5. Cook on low heat till tomato turns dry and ghee begins to separate. 6. Gently mix tomato to rice stirring carefully because we don't want the rice to break. Mix till well mixed. Serve hot tomato rice with raita.